It is officially fall! So despite the tank top and shorts I wore today, my pumpkins are finally out. I started with my mantle. In the past, I have only changed my mantle for Christmas. 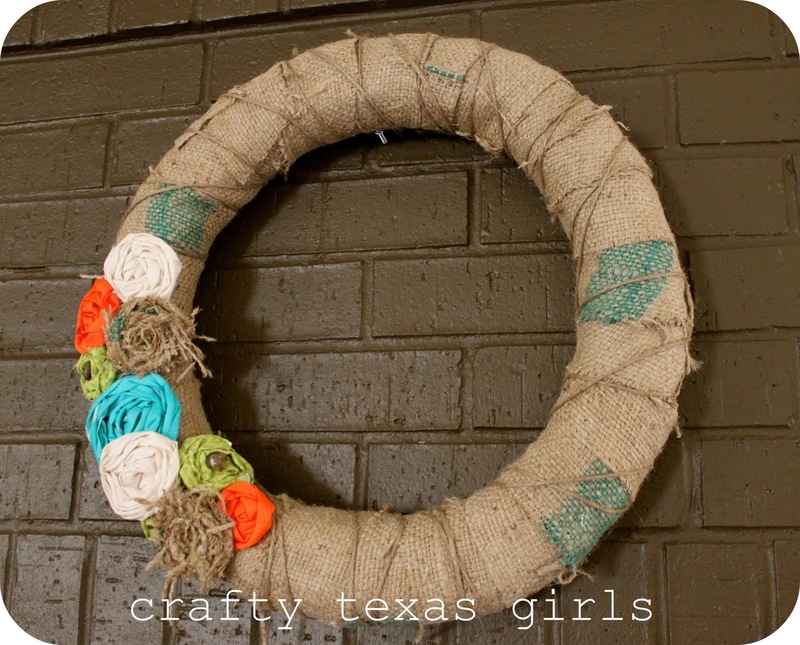 But this year, I made a beautiful new Rosette Burlap Wreath and I couldn't bear to put it outside. The color scheme- bright orange, turquoise, lime green and burlap seemed better suited for indoors. 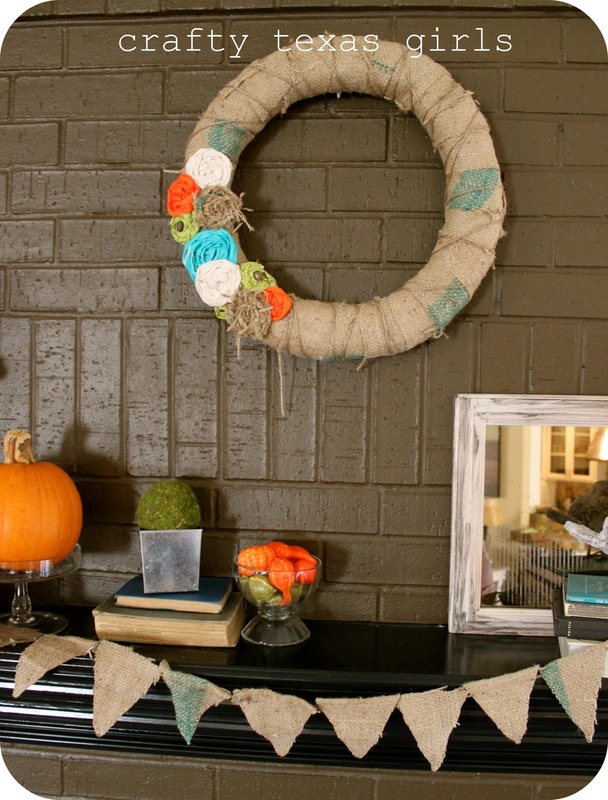 Turquoise is my pop color, so the wreath is a fun way to coordinate and add some bright fall colors to my home. 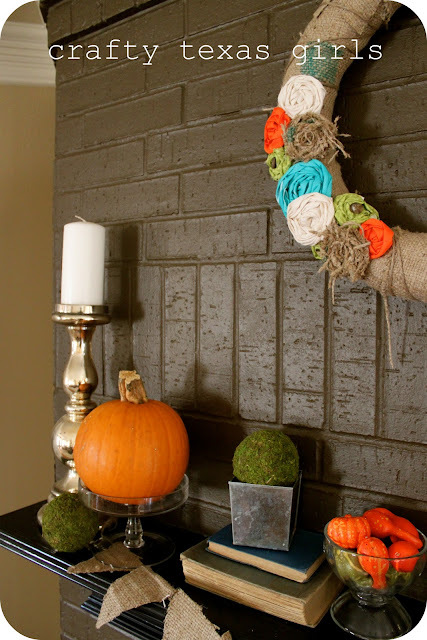 To make this wreath, just read the detailed 'how-to' for this Rosette Burlap Wreath and get more fall decor ideas in my October column over at SouthlakeMoms . I had a good time 'shopping my house' for the mantle decor. I stacked a few old family books to create height variations. Then I used a mini cake stand and a candle stick as 'pumpkin pedestals'. This is one of 'oven cleaner antique' mirrors- it usually lives upstairs in the playroom. The little stone bird migrated in from the kitchen. 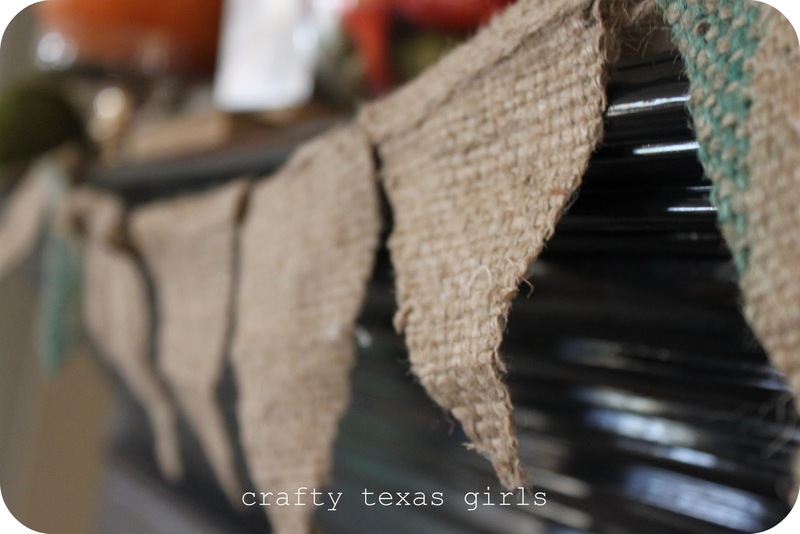 I created mini-burlap bunting using left over scraps from the wreath project. I love these fat pumpkins. My mom has a small garden in her backyard. A few months ago, she and Afton planted pumpkin seeds in the hopes of growing a little jack-o-lantern. But our extreme heat and drought had hurt the vines. They are blooming, but probably won't produce any pumpkins. Never the less, when we went to visit my mom, these two cute pumpkins were nestled in the garden. The girls were thrilled to 'pick a pumpkin' from Grammy's garden. So it is only fitting that they are proudly on display. I like how the turquoise details tie in with the rest of my 'regular' decor. Lots of textured neutrals with a that burst of color. What about you- do you change your mantle for the seasons? 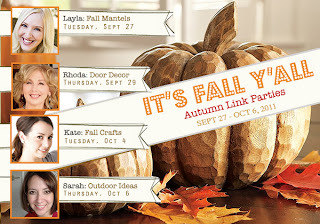 Stopping by from the Lettered Cottage fall mantel party... This is such a cute and colorful mantel! I love the pops of turquoise. This has cemented my thinking that I need to bring more bright and cheery colors into my decor--thanks for the inspiration! 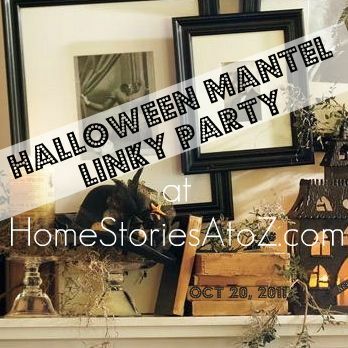 Adorable mantel! Love love your wreath!! Awesome job! Love it all! I love it! 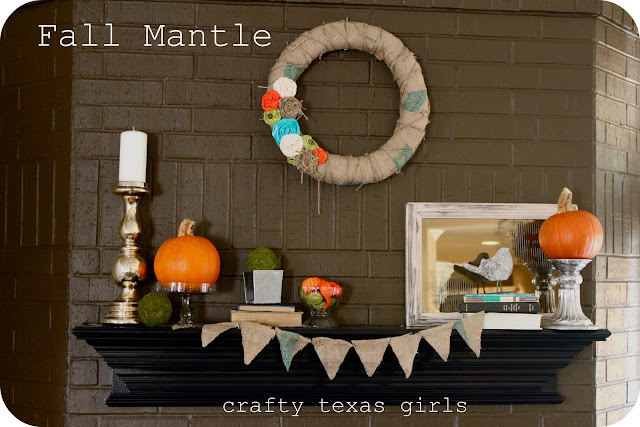 I adore a good mantel and yours is definitely beautiful. I'm glad I found you through TT&J! This looks great! I love all of the burlap! Thanks so much for sharing! What a great fall mantle! Thanks for the inspiration! I found you through Tatertots and Jello btw. Totally love the pumpkins on the candle stick AND that you're from Texas! Great mantle. It would be great to have you link this post to my weekly meme Seasonal Sundays. 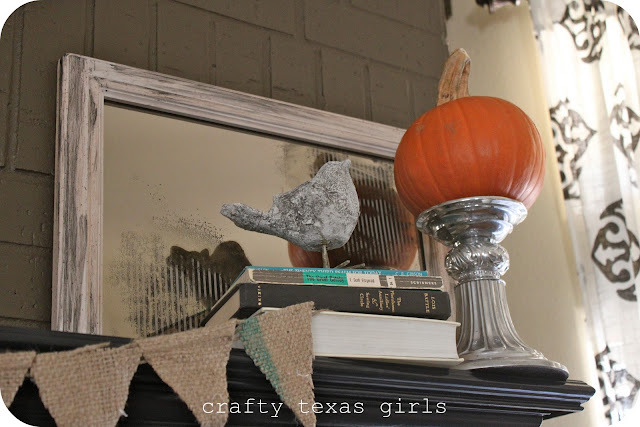 How did you do your burlap banner? Did you attach the pieces to twine or ?? THANKS for the help. Making my burlap wreath tomorrow. 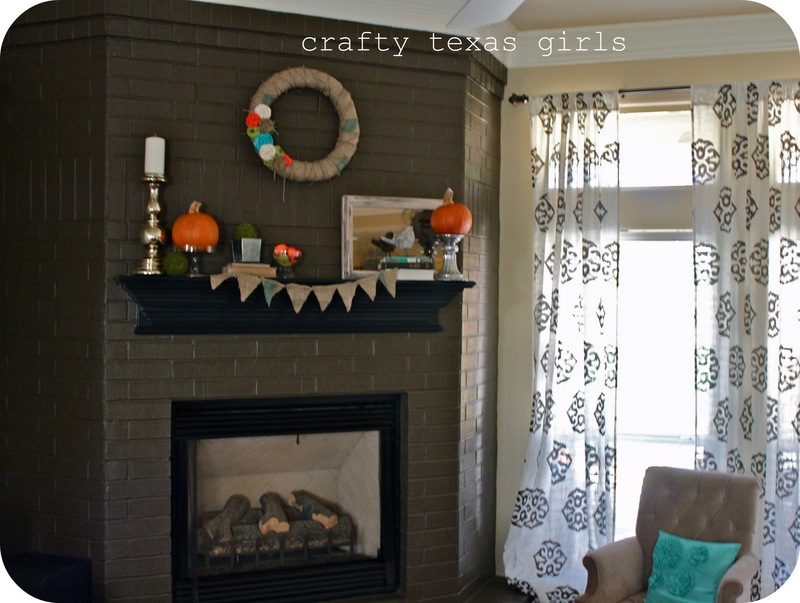 Liz- I made the burlap bunting by with hot glue, jute twine, and burlap triangles. It was fast and easy! Just a line of glue across the back of each triangle and then press the twine on. Have fun making your wreath! That is sooo cute! I love the burlap with the pops of color.